Mornings are not easy. Seeing your favorite people and their faces (groggy as they may be) helps. Additionally, seeing your favorite things in your favorite colors certainly helps. Our mood is tied to so many elements. To me, color is undeniably a key element. One of my mottos in life is to “always live in color.” Meant figuratively and literally. I won’t get into the figurative sense in this post but I would like to discuss the literal sense of “living in color” through home decor. Since we’re discussing mornings, I thought I’d use my upstairs bathroom vanity to demonstrate how my mornings are more pleasant when I see everyday things in my favorite hues. My upstairs bathroom is typically the first room I visit in the morning. 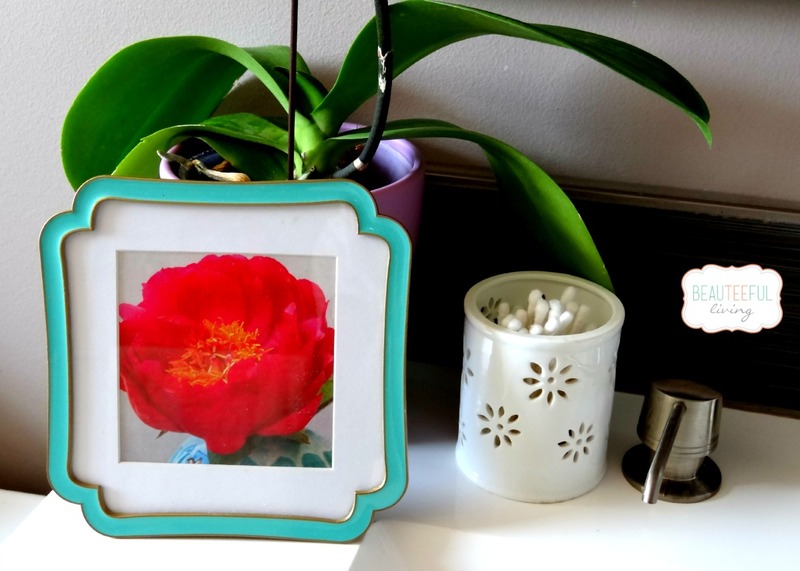 1) Turquoise frame with photo of my favorite flower (you guessed it — peonies)! 2) Less is more, especially when it comes to the counter top. Beat the clutter by only including key essentials that you use. Since my upstairs bathroom is essentially mine (kids and hubby mainly use the downstairs bathroom), I only keep my items on the counter. Toothpaste, toothbrush, and floss are neatly contained in a white votive holder (see below). Who says votive holders are only for candles? My hairbrush is in the color fuchsia while comb is turquoise. Yes, both are among my favorite colors. Aside from dental hygiene and hair brushes, I keep all other essentials tucked away in my vanity cabinet. Picture Frames – Notice that my mirror shows a reflection of a coral picture frame. Also pictured is the turquoise frame mentioned earlier. Flowers or a Plant – Depending on how much light your bathroom gets, you may be able to get away with an orchid plant. If not much light, the orchids will still last longer than fresh cut flowers. Lucky bamboo is another option to bring in some color and life to your bathroom vanity. Holder for Combs or Toothbrushes – My turquoise brush holder is one of my favorite things on my vanity. The ceramic finish is very glossy so it further enhances the color I love. Now, we can’t talk about starting the mornings beau-tee-fully without mentioning coffee or tea. 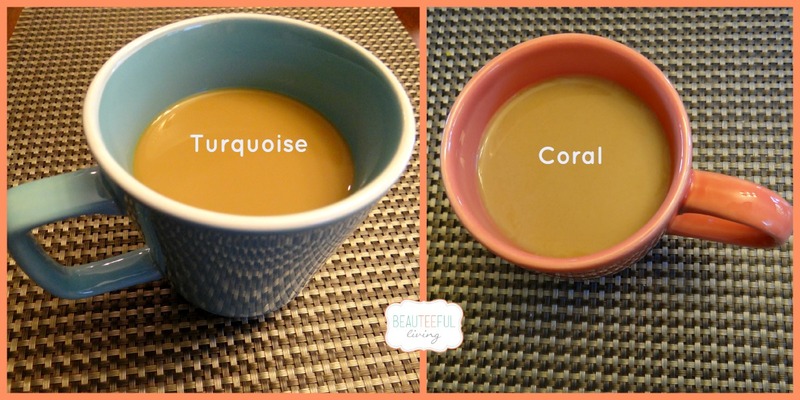 Surprise, surprise... my favorite mugs come in 2 of my favorite colors: turquoise + coral. You always hear how we should start our day right by eating a proper breakfast. I agree. Wholeheartedly. Nonetheless, while starting the morning right with food is important, I also believe in starting the morning with seeing your favorite view. First, I trust that your loved ones are what you look forward to seeing in the morning most. Second, I hope you wake up to a lovely view that is entirely your own. Do you have a favorite decorative item on your bathroom vanity? Like this post? Have a comment? Sharing is caring! Thanks for reading. I have been trying to figure out what to do with my master bathroom. Right now it is DRAB!!! Adding some color sounds like just the thing. Thanks for the motivation! 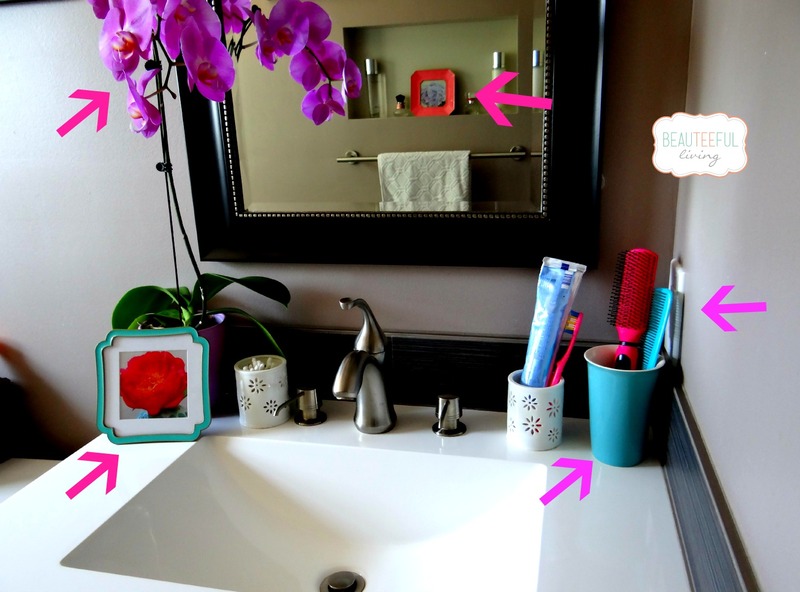 I love the set up in the bathroom it’s perfect with the pop of color! 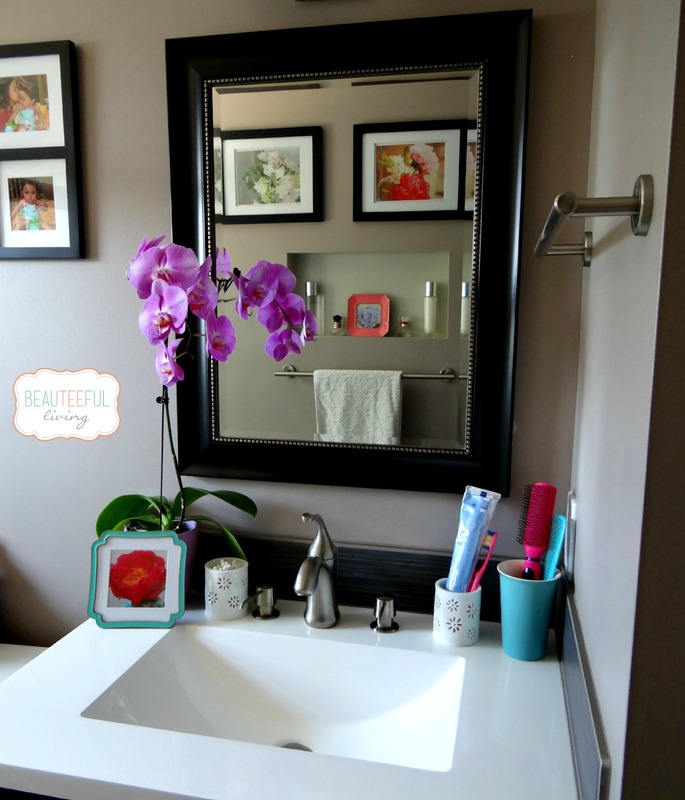 You have a beautiful bathroom… I especially love the orchids and your pedestal sink. Mirrors are lovely too. Those pops of color are indeed cherry! I need to think about this more when I accessorize. Thanks, Liz! 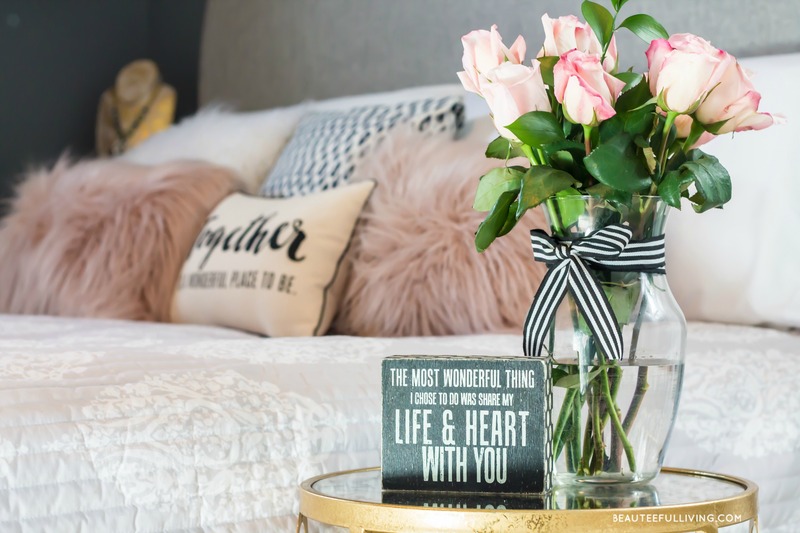 Yes, it’s the subtle pops of color that make all the difference in a room. I love color like you and I agree that nourishing your body is important but we must also think of feeding our minds and spirits to set the mood and intention of the day. You’re very creative! Awe! What a beautiful and neat set-up. I too like pretty things. I do agree with you though. When you wake up in the morning and we see the place looking so happy and bright (and in order), we tend to start the day with a smile. I love turquoise too, and it will be one of the colors that I am going to incorporate in our house once I am finally done with all these painting and what not. I love everything! Thanks, Adin! Good luck with all the painting you have to do with your place. those look great. i love the warmers. I’m in the process of redoing my whole bathroom. I totally agree, nothing like seeing your favorite colors when you first wake up in the morning. That’s I am going to be painting my bathroom soon in that color. Thanks for reminding me to always live a colorful. My favorite thing on my vanity is my Scent glow warmer. It makes the whole bathroom smell delightful. Ooh, Scent glow warmer. Bet your bathroom does smell lovely with that. Good luck with your bathroom re-paint. Bet it will make a big difference. what a lovely post 🙂 i really enjoy bursts of color too. right now i’m in love with turquoise. Thanks! Yeah, I can’t seem to get enough of turquoise. Less is more! I totally wish we had less stuff! LOL Its hard with kids though, but I love your mirror and and storage! Love all the colors in your bathroom! Everything is so thoughtfully put together. Thanks for sharing! I really believe in less is more too. Sometimes to many things can clutter our environment and ends up cluttering our emotions. Your bathroom is beautiful and great way to wake up in the morning. I love the vanity and and the colors! Beautiful! This is really great. I need to pare down everything in our bathroom. I really wish that my bathroom looked like yours!! Great pictures! I love the design. I am horrible at design also. My house is just thrown together. One of these days I am going to sit down and figure it out. Thanks for the compliment, Misty! I think I need to add color for my morning! I think it will help me to wake up. Thank you for the tip! Ooooohhhhh this is so pretty. I am TERRIBLE at interior design. This is so chic and simple with the perfect pop of color. Thanks for your feedback, Jaime! I’m sure you’re exaggerating about not being good with interior design. No one needs to live in a home straight out of a catalog. Just simple touches, here and there. 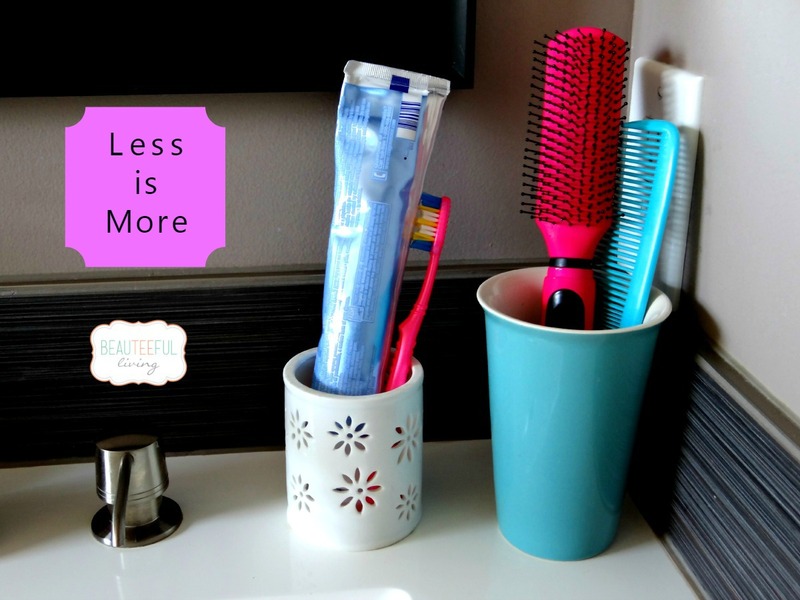 I do not like clutter.. so for me less is definitely more! I like seeing colors i am just not the person who can pick them out so good to match up. I do think less is more, especially when you can accent a centerpiece or add to something simple with colors. I love orchids and would love to eventually have some in the house. I agree, Kori :). Thanks for commenting. Thank you for the helpful suggestions! You’re very welcome. You can ask any questions, anytime. I think the beach photos and the “sea shore” framed art will work great! I recently renovated my bathroom and your piece on bathroom decor was super helpful! I have one question, is it okay to frame and keep casual family pics in the bathroom? Thanks, Sabrina! Yes, it is definitely fine to have casual family pictures in bathroom. My suggestion would be to feature them in certain themes (don’t go overboard with too many pix). For example, for my bathroom downstairs, I have the kids (and dogs..lol) in their terry cloth bathrobes. It cracks me up each time. I also have pictures taken of the kids at the beach and by our pool. Something water-themed would work great. Hope that helps. Congrats on your newly renovated bathroom! I agree – less is definitley more sometimes. I love the decor.